With £50,000 of extras this hefty luxury saloon was no end of fun for everyone apart from driver Sathnam Sanghera. Ford is currently running a marketing campaign for its Kuga that revolves almost entirely around a single feature – its kick-activated tailgate. Which seems somewhat reductive, like using a picture of your earlobe as a profile picture on Tinder. And a waste, given that there are many other things that make it a very good car. But in the case of the new Mercedes S-Class, an ad campaign concentrating on the extras would make sense. For this is less a car with options, than a load of options with a car attached – an entity, like Jordan, or David Gest, entirely defined by the add-ons. The price of the basic model may be around £71,000, but my test car, which came with a list of options so long that I gave up reading about them after several minutes, brought it up to £120,000. You could buy five small cars for the cost of the options alone. Which is insane. But also huge fun. The S-Class isn't a great drive – the countless aids rather detach you from the road, while safety features such as the night-view assist and the pedestrian-detection system are forever beeping at you, making you feel as if you're actually crash landing a jet rather than piloting a car. Also it's so big and powerful that even with the smaller engine option it is stressful to thunder down anything other than a motorway. 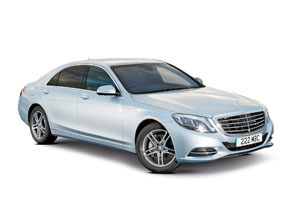 But the S-Class has always been a car to be driven in. And I can't remember the last time my passengers had such fun. I felt like Willy Wonka showing everyone the toys. Look, heated arm rests! Illuminated seat belt buckle extenders! In-car Wi-Fi! A £6,430 Burmester high-end 3D-surround-sound stereo! A choice of perfumes for air fresheners! Heated door panels! Interior lighting you can change the colour of! A back seat that basically becomes a flat bed when the front seat is folded up like a Transformer! A fridge! A frigging fridge! You could own this car for five years and not get to the bottom of it. Frankly, I'm not sure how you would ever get around trying to test certain features, such as the 'cross-wind assist function' or the '£360 air balance package'. But it was widely adored over the seven days I had it, with one of my nonchalant nieces, whose only other motoring comment had been that a Ferrari was 'a bit loud', asking to be dropped off at her school prom in it. Brilliant. And it doesn't even have a boot you can activate with a kick. Tesla Model 3: Will it keep Elon Musk's company on the road?